12 February 2018: This remarkable book in Urdu by a Muslim scholar highlights some noted Muslim personalities who played important positive roles in Sikh history. In doing so, it also highlights the great contribution of the Sikh Gurus in spreading true spirituality and promoting harmony among people from different religious backgrounds—something of great relevance in our times as well. Mohammad Habib, author of the book, is well qualified for the task he has taken up: Having earned his doctorate from the Department of Islamic Studies, Jamia Millia Islamia, New Delhi, he presently teaches at the Guru Gobind Singh Department of Religious Studies at the Punjabi University, Patiala. In his Introduction, Habib explains that his book is not a mere academic research work, but, rather, an attempt to remind the people of India of the country’s rich tradition of communal harmony (which is exemplified beautifully by the life and teachings of the Sikh Gurus). The focus of the book, Habib points out, is on positive aspects of Sikh-Muslim relations. It is true that several incidents of conflict between sections of Muslims and Sikhs were to take place in later years, but Habib suggests that this must be seen in the context of rebellions against oppression by the Mughal state (which happened to be largely Muslim). These rebellions drew support not just from Sikhs but from many Muslims, too. Habib stresses that the Sikhs who fought the Mughals or other Muslim rulers should not be thought of as having been against Muslims as such. Nor should these Muslim rulers be thought of as any sort of ideal for Muslims. Their rule was part of Muslim political history, Habib contends, and not of Islamic history. The first 90 pages or so of the book provides readers with a general introduction to the Sikh tradition, including the historical context in which it arose, and key Sikh beliefs, customs, practices and institutions. The Sikh tradition, Habib explains, focuses on nurturing what he calls inner religiousness (Mazhab Ke Andar Mazhabiyyat) and true spirituality (Asli Ruhaniyat). We learn that just as many Hindus considered Baba Nanak (1469-1539) their Guru, many Muslims regarded him as their spiritual Master (Pir, Kamil Murshid) and a Wali or friend of God (hence the famous saying: Baba Nanak Shah Faqir. Hindu ka Guru Musalman ka Pir) The wide appeal of the teachings of Guru Nanak Sahib and his successors among people from different religious communities and castes reflected the fact that they preached universal spiritual truths that are beyond the differences of name and form, dogmas and rituals of conventional, institutionalised religion that divide people. Wherever he travelled (and he travelled extensively), Guru Nanak Sahib exhorted people (Muslims, Hindus and others) to focus on what Habib terms the ‘inner reality’ (Batin Ki Haqiqat) of religion, explaining to them the worthlessness of ritualistic externalism (Zahirparasti). Because of this, vast numbers of people, including many Muslims, were attracted to the Sikh Gurus and their teachings. Exemplifying the universalism of the message of the Sikh Gurus, Habib explains that the Sri Guru Granth Sahib, the Sikh scripture which is regarded as Guru by the Sikhs, contains verses by Sikh Gurus as well as by several Muslim and Hindu men of God and in different languages. The teachings of this scripture, he tells us, are not specific to just one particular religious community but are of universal appeal and relevance, based on love for and devotion to the One God and leading an ethical life. There are strong parallels between these teachings and those of Muslim Sufis and Hindu Bhagats who advocated the path of love, Habib points out. The remaining portion of the book focuses principally on several key Muslim figures in the Sikh tradition. These include some Muslims whose spiritual compositions are incorporated in the Guru Granth Sahib, such as the famous Chishti Sufi Shaikh Fariduddin Masud Ganj-e Shakkar (also known as Baba Farid), Bhagat Sadhna ji, a Muslim from Sindh who was a butcher by profession, and Bhagat Bhikan ji, from Kakori, in present-day Uttar Pradesh. Rai Bular was another Muslim who occupies an important place in Sikh history, Habib explains. He was the landlord of Talwandi (present-day Nankana Sahib), where Guru Nanak Sahib was born. He had great love for Guru Nanak Sahib as a boy, having noticed his deep spirituality, recognising, Habib, says, that he was no ordinary child but a dervish. Even later, in between his missionary journeys, Guru Nanak Sahib would visit Rai Bular and give him spiritual instruction. When Rai Bular left the world, Guru Nanak Sahib was at his side, such was the love between them. Among Guru Nanak Sahib’s closest companions was a Muslim—his childhood friend Bhai Mardana. Theirs was a beautiful and deep spiritual companionship that lasted for more than half a century. Bhai Mardana was born in the same village as Guru Nanak Sahib. He is said to have accompanied the Guru on his missionary journeys to many places, in India and abroad (including even to Arabia, Persia, Afghanistan, and Tibet). The Guru Sahib would sing his mystical verses and Bhai Mardana would play the Rabab in accompaniment. Bhai Mardana, Habib says, had the blessed opportunity to spend the longest time with the Guru Nanak Sahib. 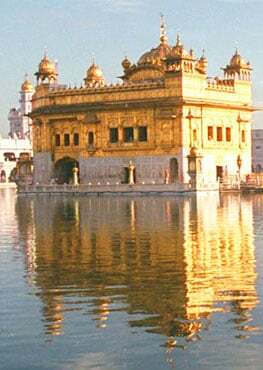 Among the several other Muslims who had close relations with the later Gurus were Bhai Satta and Bhai Balvand, from a Muslim family, who were among the first Ragis who did Kirtan or singing of hymns from the Granth Sahib, at the Harmandir Sahib in Amritsar. The Sufi Pir Bhikhan Shah Sahib had great spiritual love for the tenth Guru, Guru Gobind Singh Sahib (1666-1708). When the Guru was born (in Patna, in 1666), the Pir travelled all the way to Patna to meet him, having come to know, through his spiritual perception, that this was no ordinary child. When he met him, the Pir recognised the child as someone who would look at Muslims and Hindus with equal eye. Syed Badruddin, also known as Pir Buddhu Shah Sahib, was another Sufi who had great love and admiration for Guru Gobind Singh Sahib, recognising him as a true man of God. On his request, the Guru had employed 500 Pathan soldiers who had been dismissed from the Mughal Emperor Aurangzeb’s service. At this time, some Rajas in the Himalayan region were conspiring against the Guru, jealous of his growing influence. In the ensuing Battle of Bhangani (1688), many of the Pathan soldiers whom the Guru had employed on the Pir’s suggestion deserted him and went over to the Hill Rajas. The Pir was so upset by this that he went along with his four sons, his brother, his brother-in-law and some 700 of his disciples (Murids) to assist the Guru in the battle. The Pir and his relatives and disciples were not trained soldiers. Yet they fought very bravely and the Guru’s side won the battle. In the fighting, among those who died were two of the Pir’s sons (Syed Muhammad Shah and Syed Ashraf), one of his nephews (Bhurey Shah), and many of his disciples. Habib says that being a lofty-minded dervish, the Pir never lamented his martyred sons and disciples, for he had engaged in this as a service as a duty, considering it his good fortune to have joined along with the Guru in the battle for the sake of Truth. The Guru deeply appreciated the Pir for his dedication. After the Battle of Bhangani, the Hill Rajas sought to instigate Aurangzeb against the Pir on the grounds that he had joined hands with the Guru. Usman Khan, a local official, arrested the Pir, tortured him and then executed him. Later, when Banda Singh Bahadur learnt of this, he avenged the Pir’s execution by killing Usman Khan. Ghani Khan and Nabi Khan, two Muslim Pathan brothers, were also great admirers of Guru Gobind Singh Sahib. They played a key role in enabling the Guru to pass through the Mughal lines in the wake of the battle of Chamkaur between the Sikhs and the Mughals. Another such Muslim was Sher Muhammad Khan, then ruler of the Malerkotla state. Since Malerkotla was under Mughal suzerainty, the Nawab had participated in some military action against the Sikhs on Aurangzeb’s orders. But when the Mughal Governor of Sirhind, Wazir Khan, ordered that two innocent children of the Guru Sahib, Sahibzada Zorawar Singh and Sahibzada Fateh Singh, be walled up alive, he protested, saying that was against the Quran, which did not allow the killing of innocent children. On hearing of the Nawab’s brave effort to save his sons, Guru Gobind Singh thanked and blessed him. Habib provides some insightful details of some more such Muslim figures who supported and served the Sikh Gurus: people such as Malu Shaikh and Ubarey Khan/Abdur Rahman Khan (who were blessed to be among those who spent time in the service of Guru Nanak Sahib), Hakim Alimuddin Ansari (a Mughal official who greatly admired Guru Arjan Dev Sahib and who played a role in persuading Jahangir to release the Guru when he had been imprisoned in Gwalior), Bhai Abdullah (a contemporary of Guru Hargobind Sahib), Babak Rababi (a ragi at the time of Guru Hargobind Sahib, who would sing verses from the Guru Granth Sahib very beautifully), and Khwaja Abdullah (Kotwal of the Kotwali in Chandi Chowk in Delhi where Guru Tegh Bahadur Sahib [1621-1675] had been imprisoned by the Emperor Aurangzeb. Impressed by the Guru’s character, he became his firm supporter. When the Guru was martyred, Habib writes, he quit his job and went to Anandpur Sahib, which had by then become a major centre for the Sikhs, and stayed there). This book is a noteworthy instance of interfaith harmony and understanding at several levels. It is a balanced and deeply appreciative study of a particular religious tradition by someone who is from another tradition—which should remind us of the need for people of different faiths to learn about other religions than the one they happen to have been born into or claim to follow. It is also an account of the universal message of the Sikh Gurus, a message which is based on the unity of God and the oneness of all humankind and which has a continuing relevance in our times, too.